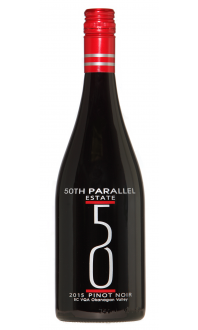 Sorry, 50th Parallel Estate does not ship wine to United States. AROMA: Pineapple, lime zest, wet slate and bees wax. PALATE: Lime leaf, nectarine, lemongrass, jasmine and honey. Green apple and a pronounced earth stone structural element carries through the palate to finish. 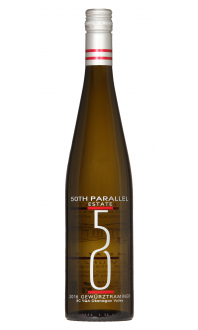 Mouth watering acidity brings tension to the fruit forward entry to give the wine intense character and raciness. THINK OF: Swimming with sharks. The hair raising tension and expectation that comes every time one of the curious fish get a little too close for comfort. The wine will always keep you nervous with anticipation through to the last sip. DRINK WITH: All foods with high concentrations of fat but void of spiciness or heat. Always with hard white cheeses. Oysters and buttered shellfish will bring a mind blowing culinary pleasure. Serve between 3-6 degrees Celsius in a white aromatic glass. Cellaring is encouraged for 5-8 years.